Essentially, the LG Watch Urbane is a pricier twin of the LG G Watch R. If style isn't your chief concern, then you might as well grab LG's more practically-priced watch. Frankly, LG's first smartwatch didn't offer all that much. It even lacked a button to turn off the display. Its second attempt, the LG G Watch R, went down a more traditional route, but still lacked the class compared to the Moto 360. 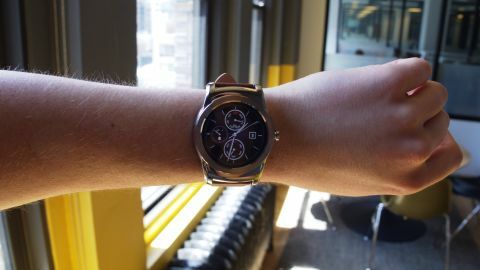 It seems like the third time's a charm with the LG Watch Urbane. It has nailed a posh look and brought function along for the ride, too. However, the Urbane is a too small a step forward. It's essentially a dressed-up G Watch R with nearly identical dimensions and innards. The Urbane wasn't cheap when it released, going for $349 (£259, AU$459) - a bit more than the cheapest Apple Watch at the time. But you'll be able to pick one up much cheaper than that, as low as $200 if you look hard enough. Pricing aside, the Urbane has a distinct look that's certainly polished, but it's clearly been tailored for a certain demographic. Despite images of women sporting a variation of the Urbane, it looks like this watch was made for businessmen. This isn't a huge problem, of course, but good luck getting women interested in wearing a chunky piece of metal and leather that won't fit right. Decking it out with Android Wear Mode bands certainly helps to make it more of your own, and the brown leather band we swapped out in place of its default, and very executive black leather strap, looks a little more casual. The Urbane has been updated with the latest Android 6.0 Marshmallows software, which brings with it some battery optimization and expanded gesture support. But the question as we look toward the fast-approaching future of Google's wearable platform is whether this smartwatch will support Android Wear 2.0. We're currently unsure, but we'll keep this review up to date. The LG Watch Urbane sports a 1.3-inch P-OLED display (320 x 320, 245ppi) which matches the LG G Watch R to a tee. However, when stacked up against the 400 x 400, 286ppi screen of the Huawei Watch, it pales in comparison a bit. Like the G Watch R, the Urbane's screen is lovely to stare at but sometimes looks pixelated, depending on which watch face you plop on the front. I found the Classic face had the most pixelation on the dial. The moons on the Moonphase face also look a little blotchy. Overall, the pre-installed watchfaces aren't too great. Put it side by side with the Apple Watch and it's the Cupertino firm's timepiece which has the better screen, but on its own you're unlikely to have an issue with resolution. Direct sunlight is an issue for the Watch Urbane, as it is for the G Watch R, and I did find myself having to cup my hand round the device a few times to see what was on screen. Viewing angles meanwhile are more than acceptable, something it has over the Pebble Steel and Pebble Time.